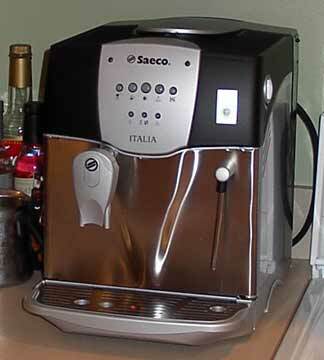 Who minds getting another year older. . .
. . . when it means you get a Saeco Italia for your birthday? Can you believe it? That's a fully automatic Italian espresso machine sitting on my kitchen counter!!! I can't begin to tell you how excited I am (it's not just the caffeine talking)! Thank you Pete & Mom! I got lots of other wonderful gifts too, including one fiber related item -- Knitting in America. What a gorgeous book. On a different note, Pete is shaving his head for charity. You heard me right! Please take a look at the links at the top of the right sidebar. MagKnits is going live SUNDAY!!!!!!!! Thanks for all the nice birthday wishes! It was awful sweet (and sneaky) of Pete to post about my birthday on my blog. I'll post more on my birthday festivities on Monday. I'm afraid that I don't have much of an update on my knitting. Liv's sleeves and the LL Motherlode socks are both progressing but don't look all that different from the last pictures I took. I have finished another book though and I have update Booga J Reads, my reading blog. Check it out! Today is Julie's birthday! Being a gentleman, I won't reveal her age...but as my dad says, age is only a number. And Julie has the energy and enthusiasm of an 18-year-old girl, but with infinitely more wisdom and common sense. Please give her your warmest wishes on her special day! I finished up the front of Liv and started on the sleeves. I decided to do two at once becuase I want this sweater finished soon! 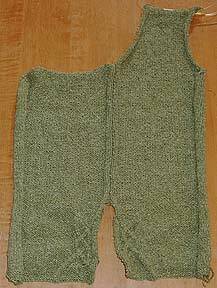 Last night I finished up the "fancy" part of the sleeves, so now it's on to the boring reverse stockinette. Yes, I have been working on Liv. The front is nearing completion, although there were some errors in the pattern and I think I'm going to have to do a little work on the back. I have to do some row counting and figuring first. Before I continue I'm going to sit down and make sure that I know where I'm headed. The last thing I want is for the arm holes to be too big or small for the sleeve caps. 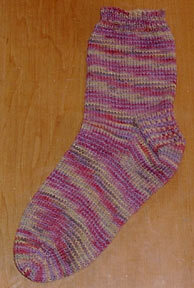 And I finished the first Mother Lode sock. 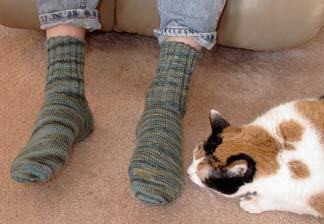 I hesitated to cast on the second sock since I really want to get the Liv issues worked out first. And look what arrived in the mail a few days ago! No, not the kitty -- that's Fancy (aka Fancy Pants) our kitten -- it's a big box of Heilo for Pete's Bessengen. I need to finish up Liv first and I think I may need to purchase some needles, so this project is a few weeks away from being started. I'm excited to be making my first adult sized stranded sweater! I got the yarn from Bea Ellis Knitwear. I was so pleased with the service! Bea was friendly, she sent me personal emails to let me know when the package would be arriving and she even included a Dale patch that I can attach to the sweater when it is finished. I ordered this yarn at the end of January when it was on sale. This month Tiur is on sale and I am fighting the urge to buy some for a sweater for myself! Now for my thoughts on atheism. . . I am an atheist. Yep. That's right. And I'm not ashamed of it. Does everyone that I know and love know about this? No. There is such a stigma attached to being an atheist that I have not been able to come completely "out of the closet." My family knows, my friends know, but my husband's family does not. They are God fearing Lutherans and I'm sure they would see this as a serious defect in my character. In addition, Pete's parents are older and quite conservative. I think that hearing that I was an atheist would actually cause them a lot of grief and sadness. I know that they wouldn't understand that I am happy and content with my belief system. My father-in-law is fighting a very difficult battle with cancer and I would never want to cause him, or my mother-in-law, any additional pain. 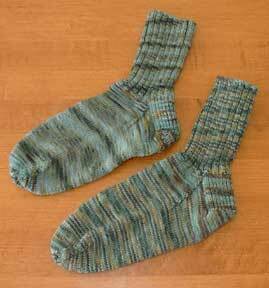 I couldn't finish a pair of socks without casting on another. I'm using Lorna's Laces again, but this time I'm knitting with US2's. *So* much better that the US 1's. I am still getting the swirl pattern with this yarn despite the change in needle size and the change in pattern (60 instead of 72 stitches). 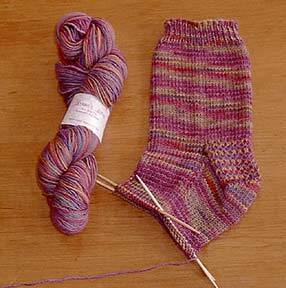 Time will tell what sock #2 will look like. One nice thing about making so many socks is that I have pieced together my favorite parts from different sources and I now have my own personal sock pattern. I still like to switch things up though. The latest addition to my pattern is the eye of partridge heel. I've used it a couple times now and I think it's my favorite, mostly because of the decorative aspect. Doesn't it look pretty? I would love to hear your favorite sock tip or technique! It's been a rough couple of days. Yesterday I didn't get out of bed until around dinner time. I'm feeling so much better today though. I even felt well enough to knit and you won't believe what I finished. . . the cursed socks! After almost a year (over a year if you count the first two attempts to start them) they are finally done! Why did these take me a year? I really don't know. I think that I should have probably used size US2's with the Lorna's. 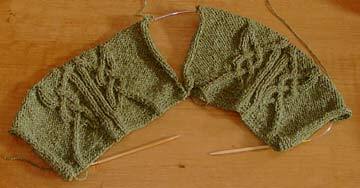 And I know that the ribbing on the top slowed me down. Then there was the broken needle -- ugh. However I have to say that Brittany is true to their word. I emailed them to tell them that I broke one of my double points and they sent me 3 (yes 3!) replacements. Here are the socks on Pete, and that's Mud (aka the old lady) off to the right. I'm sure you could tell from these pictures that there is some handpainted weirdness going on here. They are the same colorway and from the same dyelot, but there is something not quite right. Perhaps it has something to do with my tension. Or maybe it has to do with where I started in the skein. However, there is no denying that there is a lot more of the light blue color in the first sock that I knit. I don't mind and Pete doesn't mind, so it's not a problem, it's just strange. Happy Valentine's Day everyone! 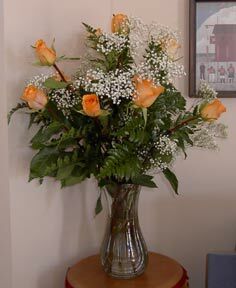 Look at the beautiful roses that Pete sent me! Aren't the pretty? I have a cold that is starting to get nasty, but I have been spinning on my new wheel anyway. I just can't resist. Here is the second mini skein that I spun up. (The first one was pretty bad.) It's a 2-ply wool spun up from some of the Lorna's Laces Gold Hill roving. It is a little un-even and a bit over twisted, but I figure it will take me a while to get a feel for the wheel and how quickly I need to treadle. I tend to try to go way too fast. The color variations are strange because there are places where the different colors from the two ply's matched up and places where they didn't. I think that on a multi-color roving like this I prefer to Navaho Ply to preserve the colors. Let me find the old photo of the Navaho plied Lorna's I spun on my spindle. . . There it is. See how the individual colors remain seperate? In this particular colorway I think it looks much better. Well, I'm feeling pretty lousy, so I think I'm going to go sit on the couch, drink some green tea and eat come conversation hearts. Have a happy Valentine's Day! Why, it's an Ashford Joy Spinning Wheel!!!!!!!!!! Isn't she pretty? Here's the stats. . . This wheel is made by the folks at Ashford. It's so nifty because it folds up and fits right into that carrying case I showed you. I found this to be one of the biggest selling points. 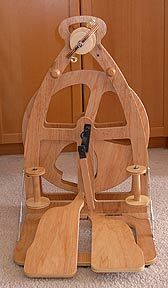 In addition, it is double treadle, has four flyer ratios (It can spin fine to bulky yarns), has a built in lazy kate and uses scotch tension. I had never in my life spun on a wheel until this arrived yesterday. After only about an hour I had spun up a fairly decent 2 ply, so you know it's easy to use! I got the wheel from the wonderful guys at ThreadBear. I feel fortunate to have someone that I trust so much to buy this wheel from. They are the best! Now, I never like to spend any money so I feel that I have to justify such an extravagant purchase. I have been working *hard* and I deserve it! I have been fortunate to have a few really good months at my online rubber stamp store -- Stamping Online. It's a lot of hard work, but it feels good to have the business doing so well. And. . .
Black Sheep Bags is starting to do well too! I *truly* appreciate all the online knitting bloggers who have made this a success! No, I'm not making millions, but I am above the break even point. And even more important, having this business has been a creative outlet and a great self confidence booster. I still can't believe that people want to make things that I have designed! Thank you!!! Maggie made a stripey version of Lily. Check it out! A great introduction to two color knitting! 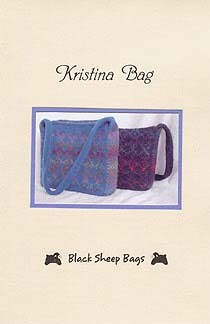 The Kristina Bag uses one skein of Noro Kureyon and one skein of Cascade 220 (2 skeins of Cascade for a longer handle.) Instructions for both the zippered and un-zippered versions are included. Approx. finished size is 8" X 2" X 7" (6 ½" for zippered version). If you are ready for slightly more advanced techniques, this design is for you! I mailed her out this morning and she will be available for purchase online through ThreadBear next week! The guys at ThreadBear are offering some super kit pricing for the first couple of weeks that Kristina is available. 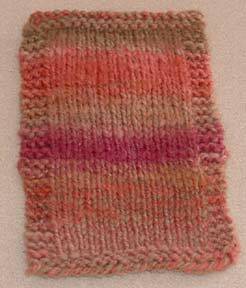 The kit includes the pattern a skein of Cascade 220 and a skein of Noro Kureyon for $17.50. If you want a longer handle, or you are afraid that you are just a really loose knitter and want a little extra, they are offering another kit which includes the pattern, *two* skeins of Cascade 220 and one skein of Noro Kureyon for $23.00. What a deal! Just send them an email at info@threadbearfiberarts.com to order!